The Saharan desert has just chewed me up and spat me straight back out; over and over again in a week of highs and lows in ‘The toughest foot race on earth. I completed the 29th epic race finishing in 377th place out of 1029 starters with a total of 917 finishers. For anyone who has ever done the race completing in the end is in itself a great achievement and whilst the experience has most definitely enriched me the brutal race at times took its toll on me and made me question myself and push myself to dig deeper than I ever have before. I went into the race with some huge training mileage under my belt and felt the fittest I’ve ever been in my life with high hopes of a top 100 finish….who was I kidding. This race is mean. By all accounts, Patrick Bauer, Race Director, was keen to ensure that this remains known as ‘The toughest foot race’, and he certainly accomplished that. With 20 people eliminated on the 1st stage alone, and a total of 112 by the finish (11%), I think this may have been the highest number of non-finishers to date! With such a remote location we are all bussed from Ouarzazate 6 hours out to the desert past the village of Merzouga. Camping begins 2 nights before the race actually starts which means 2 extra nights sleeping rough with no showers to add onto the full week of racing. A great tip we picked up prior to coming out was to bring a good inflatable mattress (£10 Ebay) for the 2 nights so you at least have a comfortable sleep, then leave it for the Berbers when race day arrives. Great tip & I can assure you it earned us many an envious look! We were registered with the Australian contingent via Travelling Fit, who actually put you into tent groups prior so there was no fighting for tents, but the Brits all pre-arrange tent buddies then race for the closest tents, which is always a bit of mayhem. You are fed and watered for the 2 nights and in true French style, the food is great. Race registration takes place on the Saturday morning & this is where the serious queuing begins, you get allocated a time slot to get your kit & medical papers checked, and this involves about an hour of queuing in the hot sun before a cursory check of your items. My checker didn’t even look in my bag, he just asked me if I had a few things, I said yes, and good to go. Flare, road book and race number issued; obligatory promo photo done and you’re set to go. Race day starts pretty much the same every day, people start to wake at about 5am, by 6am everyone is awake & faffing around. Water collection is 6:30-7:30, then you are supposed to be at the start line for 7:45 for briefing and ready for a 9am start. Of course on day 1 most people are so eager we are all there with our bags on our backs standing up listening to Patrick waffle on while it gets hotter and hotter. By the last day we are turning up 5 minutes before. There’s no doubt Patrick loves the sound of his own voice but by the end of the week asking questions like – Have you got your hat? Yes! Have you got your sunscreen? Yes! Have you got your water? Really?! Obligatory happy birthdays are sung before AC/DC’s ‘Highway to Hell’ blares out, and we are off! The helicopter zooms overhead bringing up a sandstorm around the runners and people scatter out wide to make a break for it. It’s on! Stage 1 was a killer! 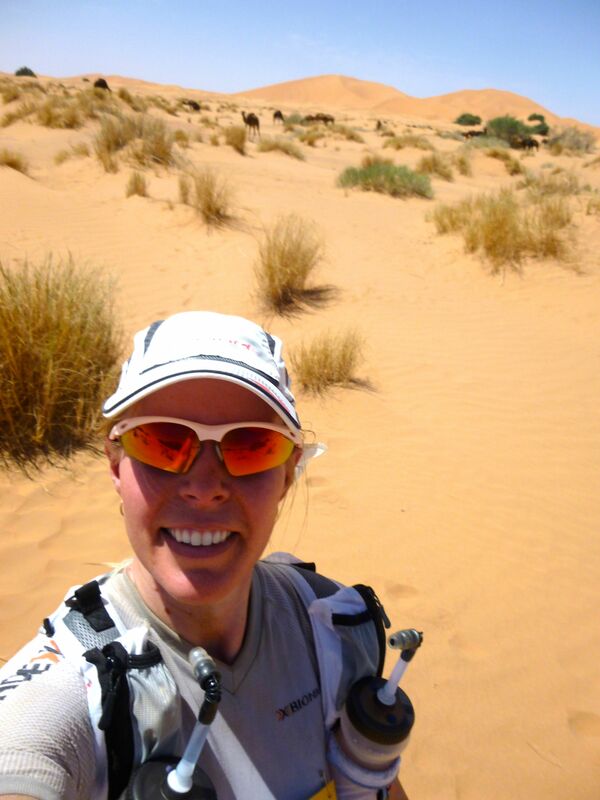 34km in total, starting with 13km of the highest sand dunes, Erg Chebbi, in the Sahara, and finishing with a further 3.5km of the same, I got the biggest wake-up call of the week. The heat was something else. Not a breath of a breeze and temperatures hovering around 46 degrees, I was seriously struggling. 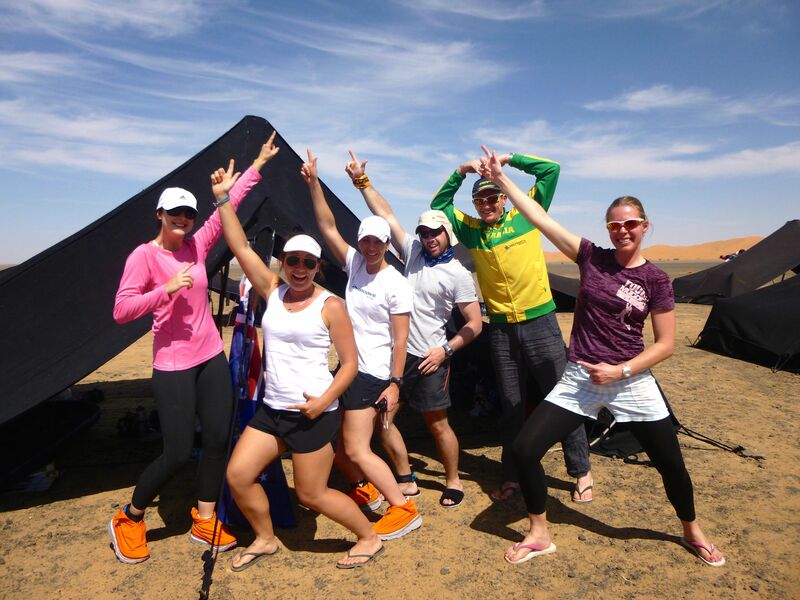 The combination of the dunes and the heat had sapped my strength by checkpoint 1 and doubts started creeping into my mind about even completing day 1, let alone the entire race! With hubby in the race as well, normally well ahead of me, I was surprised and concerned to catch up to him at checkpoint 2. He was struggling, overheated, sapped of all energy, and his confidence shot to bits. We finished the day together, very slowly, with regular stops on the dunes as our heart rates were through the roof, and it was scary to wonder what was happening to your body being pushed to such extremes. Dion was talking strongly of not going on, to pull out in the morning as he just couldn’t see himself carrying on. Amazing what a nights sleep and some food can do…he didn’t pull out and went on to finish the race super strongly. We lost 2 of our tent mates today, husband and wife Euan and Anthea. From all accounts Euan was vomiting uncontrollably at checkpoint 1, and there’s no coming back from that, with Anthea sticking it out with him. Sad to see them go, and pretty scary when we start hearing about the high numbers lost today. Stage 2 had me in tears! 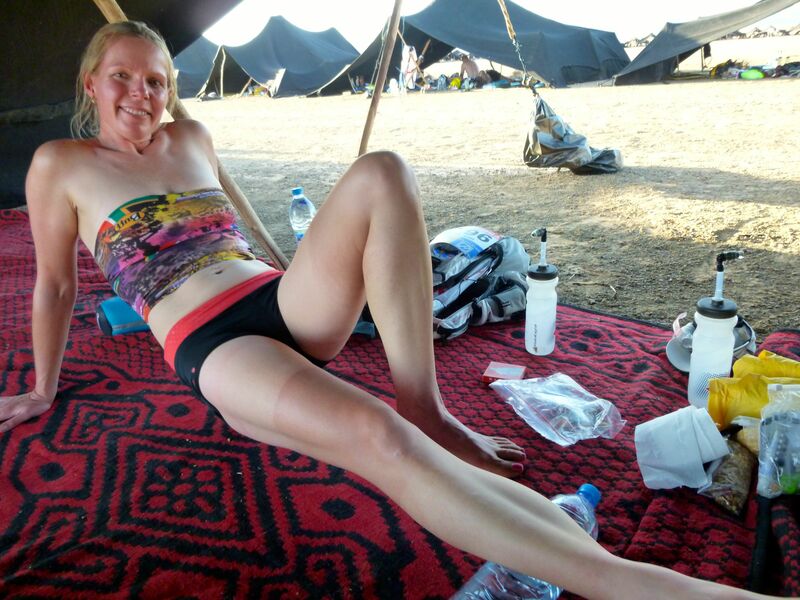 No dunes but 41km of a mixture of sand, long straight stretches of dried up lakes and oppressive heat, along with pure exhaustion saw me arrive at checkpoint 3 slightly incoherent, told to sit under the cover to cool down where I promptly burst into tears. And I don’t generally cry! Was pleased that the highly experienced 11 times British MdS runner, Rory Coleman, found me there, told me to get my hat off, pour some water on my neck, eat and cool down for 20 mins; he also gave me 2 Anadin tablets, and I was back to normal! Thanks Rory! The day hadn’t been helped by my loss in confidence in myself, and to be honest this hindered me until the very last day. Stage 3 was a grind, 37.5km through dry sandy river beds and a number of dunes again. The scenery is absolutely amazing though, and it’s a must to keep your head high to try and soak it all in. I’m still getting into camp at a reasonable time each day, around the 3pm mark, which means I have plenty of time for recovery. Recovery routine is the same each day; For Goodness Shakes first thing, snack on my leftover snacks from the day, stretch, rest and drink as much water as possible before dinner. For people getting in late each day like our tent mates, Cheryl & Kristen, it takes its toll, with Cheryl the next casualty. Out by the 1st checkpoint today, she’s is back in camp before me, and it’s clear the lack of recovery time has been too much. The night before she got in quite late, just after dark, so it’s a quick meal and straight to bed, meaning not enough water intake and absolutely no stretching and snacking. We are down to 3 in our tent now, and whilst it’s roomy, it’s a real shame to have lost 3 of our gang of tent 62. Stage 4 is the big daddy, or the long day as it’s commonly known. At 81.5km long, it’s not to be taken lightly baking in the 45-50 degree heat all day and still going well into the evening. 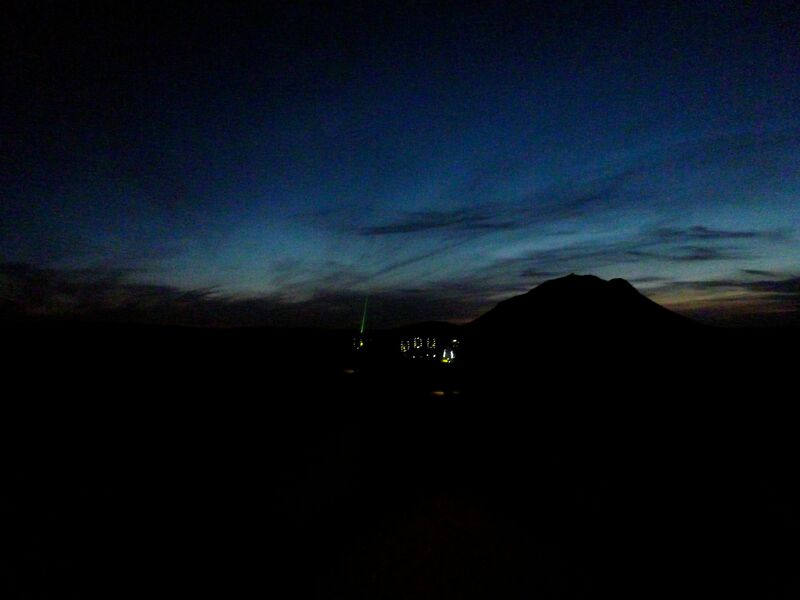 The first leg is nice and flat, and as you get through the first checkpoint, the Jebel looms up in front of you. A spectacular ascent of 30% gradient over slate rocks and loose sand is brutal! It’s a slow climb to the top as it’s single file all the way up, except for a few rather annoying French and Italian runners that attempt to pass people on the outside, dislodging massive rocks that come down through the rest of us. The last 20m is climbed with a rope, so that gives you some idea of how steep it is. I get a TV5 Monde (official MdS film crew) camera thrust into my face at the top so that will no doubt be a rather breathless scene to say the least. A quick descent brings us to a massive dried up lake that stretches out for miles. This is where the front runners come past, having left 3 hours later than the rest of us, and it’s amazing to see them come past at the speed that they are going. There’s another long jebel to climb in the full force of the midday sun, where I am literally about to die! There’s a medical jeep positioned halfway up giving a fraction of shade. Seeing another runner leave the shade, I wander over and collapse into the sand to sit for a few minutes to bring my core temperature down before continuing on for the last bit of the climb. After a massive long plateau, there’s a fun run down through soft sand which makes a nice change, but you are then greeted by a never ending crawl through soft sand which has formed into waves making it really difficult to traverse to checkpoint 4. This checkpoint is a war zone, bodies strewn everywhere! There’s quite a few Berber tents set up to provide some shade and I take about a 15 min break here before joining a group of Brits to head out again. The sun is starting to drop now so it’s a massive relief to take my hat & sunglasses off for the first time. 2 more checkpoints before the finish and I pick up and drop off with different groups along the way, the main focus being relentless forward motion. I find Matthew, a kiwi, en route to checkpoint 6 having major issues with his feet and he has sat down mid way. With some cajoling, me and another get him back up and on his way with us, it’s easier to do these last legs in the dark with a companion. We get to checkpoint 6, the last for the stage and find Ben, another Brit I’d met earlier in the day having serious issues, he starts convulsing and I get the medics over to help. He’s exhausted and just needs some sugar, rest & warmth; he gets wrapped in a silver blanket and given some gels. Giving me a message to pass on to his tent buddies when I get in to let them know he’s ok, I head off on the last leg with Matthew. It takes us about 2hrs to do 9km, as it’s now dark it is very slow going through thick soft sand following glow sticks along the way. There is any chance to find any solid ground to increase the pace. We see the finish for a good 45mins before we finally reach it at 1:45am! We get our obligatory cup of Sultan sweet tea at the finish before walking another mile to our tents, with me walking a few tents more to speak to Ben’s tent mates. Dion’s fast asleep after getting in over 5 hours before me, having had the most brilliant long day with a super time of 11hrs, smashing it finishing in 49th place! He makes me down my For Goodness Shakes recovery shake and a few crackers before I crawl into my sleeping bag for some desperately needed sleep. My last thoughts are of the hundreds still out there, making their way to the finish over the early hours of the morning, and some much later during the “rest day”. Next day is a rest day for those of us that have made it in, and the day is spent napping, snacking, chatting & rehydrating. Our tent mate, Kristen, makes it in late that morning to our relief and we all spend a quiet afternoon discussing our own trials & tribulations of the long day in between a few cat naps. We all get up to welcome the last runners in very late in the afternoon, before which we were treated to the mythical can of cold Coca Cola, which actually didn’t taste half as good as we’d all built it up to. Stage 5 is the marathon day, 42km, and Dion starts an hour and a half later than me as he’s in the top 200 at 110! This was my favourite day by far, it was slightly cooler to be fair and the terrain for the first 32km was completely runnable! Hard trail, my favourite! I join fellow Brit, Helen Bridle, for the first 2 legs, wordlessly pacing each other in turns which works really well. I lose her after checkpoint 2 due to her suffering an injury and I crack on, having an absolute whale of a time on the 3rd leg. There’s a group of supporters, family & friends of other runners that have come out at checkpoint 3, and the vibe is electric as you pass through. I feel unstoppable, and then hit a never ending sandy river bed! I think it’s more mental now than anything, and in my head sand and me just aren’t working and I’m back to a trudging walk feeling sorry for myself. Still pushing on though as I know Dion must be catching me and my goal was for him not to, or not until the finish so we could cross together. I catch a glimpse of the finish line from afar as we crest a hill and get all choked up, I have a group hug with 2 others as it feels like the right thing to do and we crack on again. The last 2km is dunes which are tough going, but I get through without seeing Dion, so 100m from the finish I stop. And I wait 23mins for him (unbeknown to me he had peeing blood but still managed to finish 87th for the day) and we hurtle to the finish together hand in hand. I must have had a 100 people pass me while I waited, but my time wasn’t as relevant as finishing the race with Dion which made it a more memorable moment. Then it’s done. It’s finished. It’s over. All of that, and MdS is no more. Patrick is there, unfortunately the magic of finishing is somewhat diminished by having to queue to have him put the medal around your neck with a kiss and a hug, but what an awesome feeling. There must only be about 20,000 people in the entire world that can say they have completed the MdS, and I’m one of them! We work out roughly when Kristen is due to finish and we head back to the line to cheer her across as well. That night the awards are presented, which unfortunately is rather long winded, so by the time Patrick introduces our surprise, a performance from the Paris Opera, we all disappear off to bed as we are shattered. Bit of a shame, as I don’t think anyone really appreciated it and most agreed that the whole evening needs a bit of improvement. The final day is a 7.7km charity walk in aid of UNICEF, and it’s compulsory but not timed, so every competitor walks even though at the end is the bus back to civilization. The three amigos from tent 62 do the last day together, chatting en route to 5th place, and highest Brit ever, Danny Kendall; and gratefully receive our lunch packs as we cross the line for the final time. Real food at last! We board the buses and after a short wait we are off for our 4hr trip back to Ouarzazate, lunches scoffed in quick succession. Shower! Oh yes please! My hair is like dreadlocks and takes 3 washes to get out of the braid it’s been in for 10 days! There’s so much sand to wash off, and there is no way that’s all going to come off in the first wash, especially when I’ve got Dion waiting for his turn. Plus we are keen to get to the bar. It’s been 3.5 months since we’d had a drink, and there were a number of cold Casablanca’s with our names on it. It’s strange to see everyone looking clean and not wearing running kit for a change, and we all catch up over a few cold ones. Although the hotel we are allocated is a right dump, the bed feels like heaven after sleeping on the hard ground, but the sleep is fitful, I think after a week of disrupted sleep it’s going to take a few nights to get back to normal. We are off early the next day back to Marrakech for the night in a magnificent riad, Riad Menzeh, before we fly home, and enjoy a couple of lovely meals and THE best hammam and massage, scrubbing away the remnants of the Sahara and leaving my skin glowing! 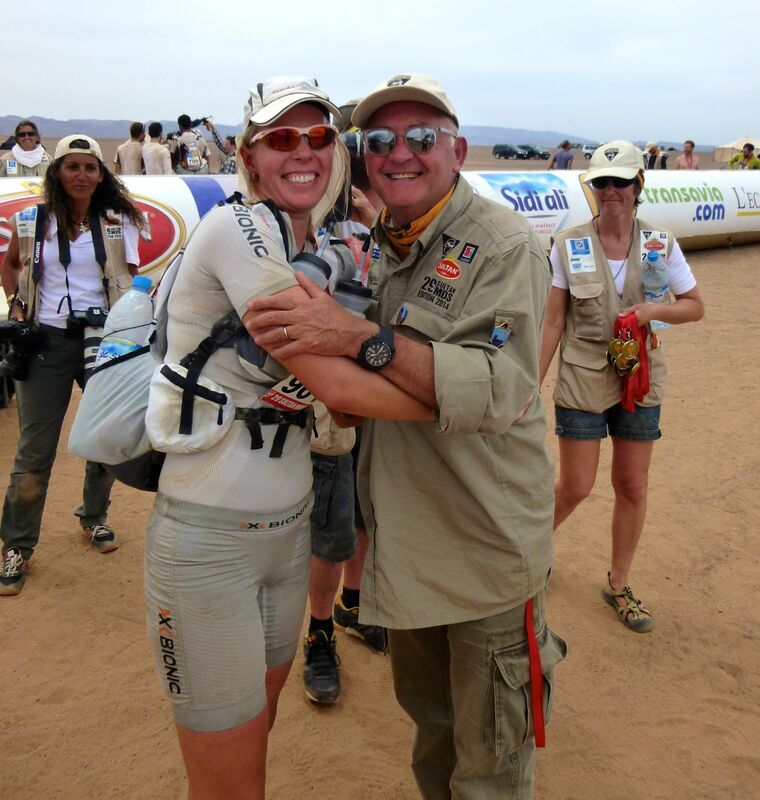 The MdS was a race on my bucket list and I am so proud of both Dion (in 108th place overall) and I for finishing. It is tough, very tough and not for the feint hearted. Would I do it again? Never say never, but for the price and all the little niggles and hassles that go along with such a highly subscribed to race (i.e queues, the long travel etc) there are a lot of other fantastic races out there to try, that will each provide their own unique experiences and challenges. But it has worked its way into my soul and my heart, the magic of MdS is not lost on me. On my next blog I plan to share my thoughts on what worked/didn’t work with my kit/training/food so I hope this is of help to future entrants. 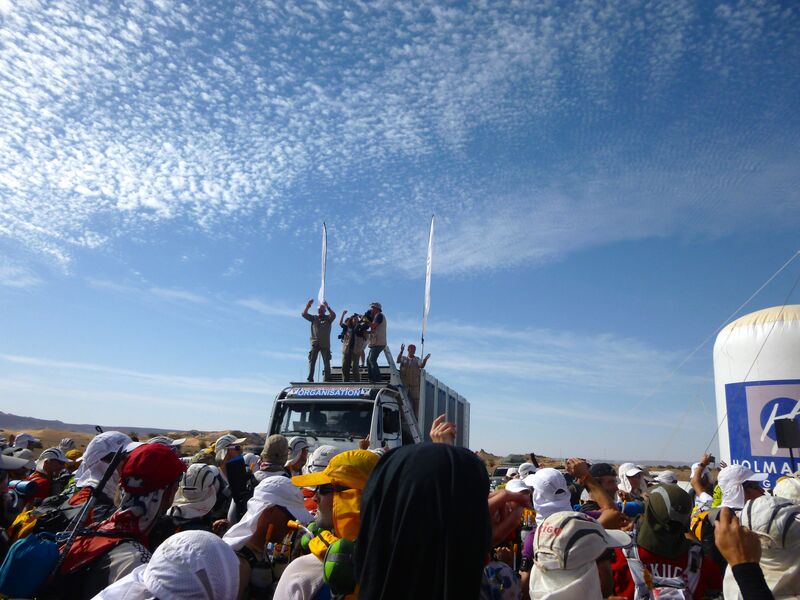 Hi Lucja, Great blog, I was following you pink gaiters for many many miles in the desert last week, occasionally in front of you as we constantly leap frogged positions. It really was a fantastic week, glad you had a good one. Thanks Matt, there were a few of us leap frogging wasn’t there! Hope you had a brilliant time, might see you again at a run somewhere soon! Absolutely fantastic achievement by both of you….I know how I felt completing a simple Glasgow HALF marathon but cannot begin to imagine the feelings you guys must have had when crossing that finishing line in this awesome challenge….VERY WELL DONE….and great blog to cap it all off. Thanks Albert, it was a great achievement, but be warned…it all starts with a half…..who knows what next! Congratulations and thanks for the great report! I’m looking forward to the next post and also to hear what races are coming next. Maybe a reunion in the Kalahari?! I cant believe you didn’t mention that you had 0 Blisters at the end. I think this needs to be mentioned in your next blog to tell us how you achieved it!!!!! Ha, Injinji socks and pink glittery shellac nails! Hope you are enjoying those cocktails in Thailand! What an incredibly amazing experience to share with your husband. 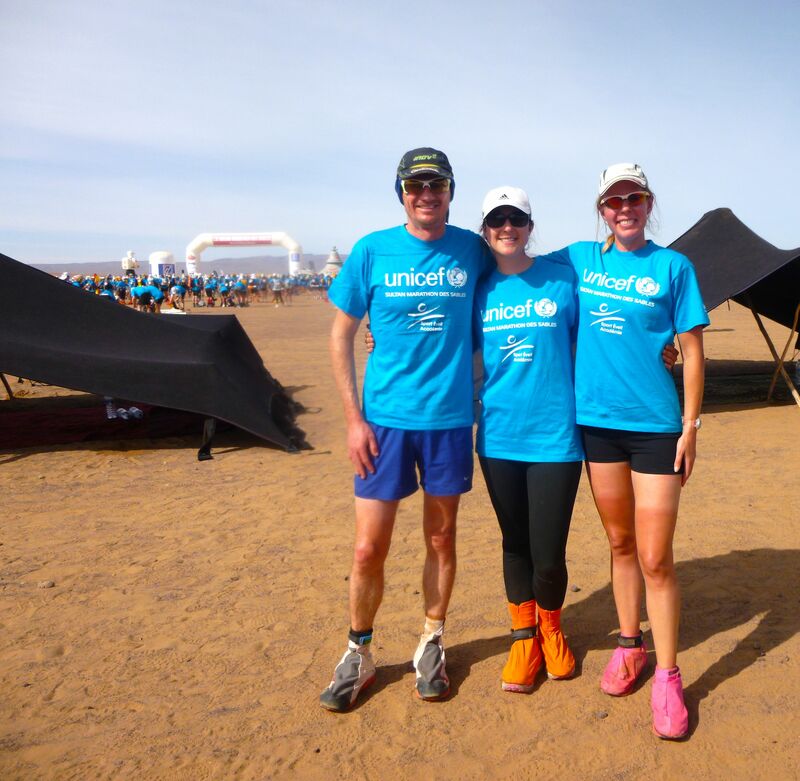 Well done to you both and thank you for sharing…thinking of doing the race in 2015. Do it! 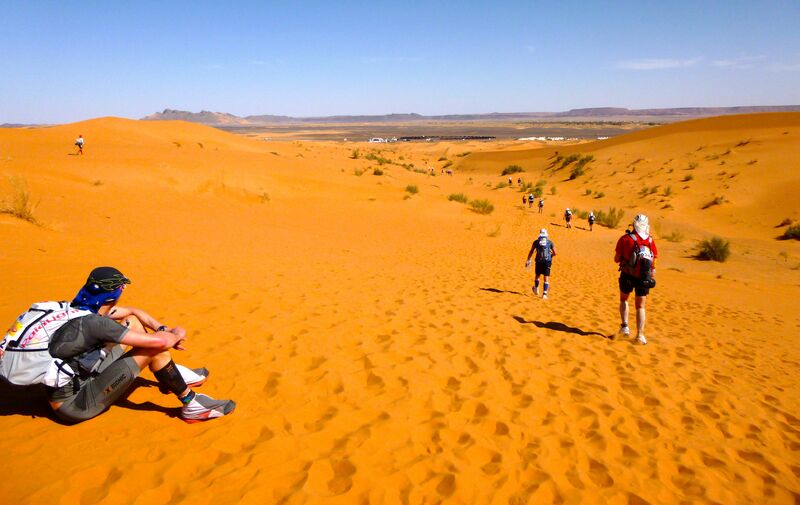 It is an amazing experience and you would love it, though you can look at Kalahari Augrabies Extreme Marathon too. It is a good one as well, at a third of the price! Wow!! What an amazing achievement! Well done Lucja!! Amazing to read about it! Wow, Thankyou for your lovely description! Honoured.